Josh, join the Democracy, Unity, Equality (D.U.E.) Justice Coalition as we honor Dr. King’s memory and fight for income equality in CT! We will stand in solidarity and urge our elected leaders to pass a MORAL BUDGET that supports all CT residents and asks the wealthy to pay their fair share. Spiritually speaking, where—or in what, or in whom—do you place your trust? Do you place your trust in God? Goddess? Spirit? Do you place your trust in the universe? In Nature? Do you place your trust in yourself? Do you place your trust in family, friends, neighbors? Do you place your trust in the people sitting around you—the members and friends of this congregation? I ask because where we place our trust matters. It shapes who we are and whose we are. And it shapes how we are in the world. Spiritually speaking, where do you place your trust? Our ministry theme for February is trust. I wrote in my newsletter column that trust occupies a different location within Unitarian Universalism than it does in most other faith traditions. Unitarian Universalism is primarily a this-worldly, relational and covenantal faith. We explicitly gather around a set of seven principles—guidelines for how we are going to be together, how we are going to treat each other, how we are going to relate to the wider community and the world. We are non-doctrinal, meaning we do not gather around a specific theology or doctrine. What does this mean for trust? It means we place our primary trust in each other. In this sense, our trust is horizontal. It extends from person to person within the congregation and out into the wider community. In more doctrinal faiths, people gather around a theological assertion, a commonly-held belief. As such they tend to place their primary trust in God. In this sense, their trust is vertical, extending “up” to God, or to wherever God lives. This does not mean that they don’t trust each other or that they don’t have agreements about how they are going to treat each other—they do. But they place their primary trust in God. I call this sermon “The Wages of Trust is Life.” This title plays with a verse in the Christian New Testament book of Romans in which the Apostle Paul asserts, “for the wages of sin is death, but the free gift of God is eternal life in Christ Jesus.” That is, if you live a sinful life the result will be death. If you put your faith in Jesus Christ the result will be eternal life. This is a doctrinal statement. Paul was among the first followers of Jesus to articulate in writing this doctrine about Jesus; a doctrine which lives at the heart of Christianity today. It has been a compelling doctrine for billions of people over the nearly 2,000 years since Paul wrote to the Roman Christian community. It is a compelling doctrine for a majority of the more than two billion Christians on the planet today. That’s a lot of vertical trust! But our collective trust is horizontal. As a Unitarian Universalist congregation, we place our trust in each other. We don’t promise eternal life. Sorry. But we do promise a life worth living. And that matters. A life of community, companionship, partners for the journey, caring, compassion, support, mutual encouragement, mutual challenge, listening, love. These are the fruits of our trust in each other; and this is why I say, humbly, the wages of trust is life. We aren’t the only ones whose trust is horizontal. From Christianity’s earliest days, Christians have debated the question: to what extent is religion about adherence to a doctrine? To what extent is religion about how we treat one another? A group of us are reading Jesus and After: The First Eighty Years by University of Massachusetts professor, E. Bruce Brooks. Brooks engages in a linguistic analysis of the Bible and other texts to show that prior to Paul’s efforts to establish Christianity as a doctrinal religion, there were Christians, centered primarily in Jerusalem but also living in communities throughout the ancient Near East, who knew nothing of Paul’s doctrines, and who focused primarily on being good to each other and their neighbors. Brooks points out that in the earliest versions of the Gospel of Mark, which is the earliest of the four New Testament Gospels, a man comes to Jesus and asks, “What shall I do to inherit eternal life? Jesus doesn’t give Paul’s answer. He doesn’t respond with doctrine. He doesn’t say ‘you have to believe.’ He advises the man to keep the commandments. He names five of the ten commandments from the Hebrew Bible—the five which have to do specifically with how we treat others: do not kill, do not commit adultery, do not steal, do not bear false witness, honor your parents. He also adds a sixth commandment which is not in the original ten: do not defraud. What is significant for Brooks is that Jesus doesn’t name any of the commandments that have to do with humanity’s relationship to or belief in God. He doesn’t mention ‘have no other gods before me,’ ‘make no graven images,’ or ‘speak not God’s name in vain.’ In this very early version of Christianity, in the decade following Jesus’ death, the emphasis is not on belief or doctrine, but on ethical human behavior, on living a good life. This tension between right belief and right living, or what some call ‘works,’ continued throughout the first century. Brooks refers to a famous passage from an early version of the Epistle of James. James was attempting to counter the emphasis on doctrine coming from Paul and his followers: “What good is it,” James wrote, “if you say you have faith but do not have works? Can faith save you? If a [sibling] is naked and lacks daily food, and one of you says to them: ‘Go in peace. Keep warm and eat your fill,’ and yet you do not supply their bodily needs, what is the good of that? Faith by itself, if it has no works, is dead.” For shorthand, you might be familiar with the phrase, ‘deeds not creeds.’ I feel a certain spiritual kindship with these early, Pre-Pauline Christians—at least Brooks’ understanding of them. There’s an air of horizontalness about them. It is no coincidence that this passage from James appears in our Unitarian Universalist hymnal. One can reasonably ask—and our critics do ask—if you don’t have a commonly-held belief, what holds you together? The answer is covenant. Our covenants hold us together. Covenant is an Ancient Near Eastern concept. The Hebrew word berit or beriyth translates variously as covenant, treaty, compact, alliance or agreement. It appears 3oo times in the Bible. Its earliest, pre-Bibilical usage was political. It referred to a treaty whereby one king pledged allegiance to another, more powerful king. Most scholars agree this political model provided the template for Israel’s spiritual covenant with God, which is the heart of Judaism. Throughout the Hebrew Scriptures God regularly revises the covenant, making promises of land, prosperity, freedom, protection, victory in war, national greatness and on and on. The people agree to remain loyal to God and uphold God’s law. Then they typically miss the mark in some way. They fall out of covenant. God commissions prophets to call the Israelites back into covenant. They come back, the covenant gets revised, and so on. The covenants within Christianity are revisions and adaptations of God’s covenant with Israel The covenants within Islam refer back to the Christian and Jewish covenants. In 1989 this congregation created its own covenant and mission; and in 2012 we crafted our current congregational covenant, which supplements the Unitarian Universalist principles with more specific statements about how we intend to relate to one another here, including treating each other with respect, engaging each other with love and kindness, listening openly, speaking our truths thoughtfully, embracing conflict as an opportunity for growth, nurturing generosity, maintaining a sense of humor, being mindful of power dynamics based on identities such as race, class, sexual orientation and gender, and seeking forgiveness when we miss the mark. We’re now beginning a process of reviewing and updating that covenant. On March 14th the Policy Board will hold open forums to discuss possible updates. None of these covenants are statements of belief. They do not express doctrines or creeds. They state our highest values. They express how we intend to relate to each other, how we intend to show up in the world, how we intend to live. We enter into this religious community trusting that each of us will do our best to live by these covenants, trusting that each of us is seeking relationships that have dignity, justice, compassion, a sense of interconnection, and love at their core. As Unitarian Universalists, we agree that such relationships here and now, in this life, in this world, matter immensely. That’s what unites us! That’s what gives us life. Indeed, the wages of trust is life. The other night my 16-year-old asked what I thought happens after we die. Some faiths answer that question with a doctrine. “The wages of sin is death, but the free gift of God is eternal life in Christ Jesus.” My answer was “I don’t know.” That seemed OK to him, but for me, as a dad who wants to give his child all the hope and confidence in the world, it felt significantly less than satisfactory. We then had a philosophical conversation about what it might mean to simply cease existing, or whether there might be such a thing as soul that lives on after we die. That was a ‘head’ conversation. But lurking beneath was a ‘heart’ conversation, a longing, a yearning for something more, perhaps a sadness that our time on earth is short, that we really may not encounter each other again after this life is done, that nothing is truly eternal. Yet, in such moments I’m also reminded: if this is the only life, then let’s live an amazing life. Let’s live the best life we can possibly live. Let’s life lives of integrity, lives that seek justice for people and the earth; lives that build beloved community; lives that search earnestly for truth and meaning; lives that recognize and value our interdependence with all other life. And this is why a covenantal faith is so important. None of us can live such a life on our own. We need one another. We need each other’s care and support and compassion and love. We may not be able to trust in some ancient notion of eternal life, but we can put our trust in each other to live this good life. Indeed, the wages of trust is life. Romans 6:23 (New Revised Standard Version). Brooks, Bruce E., Jesus and After: The First Eighty Years (Amherst, MA: Warring States Project, UMASS Amherst, 2017) pp. 19-20. Ibid., pp. 85-86. Also, I am quoting the language of James 2: 14-17 that appears in #668, Singing the Living Tradition (Boston: Beacon Press, 1993). Wright, Conrad, Walking Together: Polity and Participation in Unitarian Universalist Churches (Boston: Skinner House, 1989) pp. 7. Wright, Walking Together, p. 7. Wright, Walking Together, p. 27. The full text, complete with male-centered language, is at https://www.uuworld.org/articles/the-uuas-original-principles-1961. 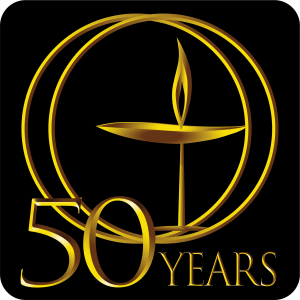 On Sunday, January 13th, we began celebrating our congregation’s 50th anniversary year. For our service the following week, ‘Martin Luther King Sunday’—which we cancelled due to inclement weather—I had planned to preach this sermon on what was happening in terms of race and racism within the Unitarian Universalist Association (UUA) fifty years ago; and to name parallels with what is happening within our faith today. I’m grateful to Martha Larson who agreed to postpone the service she’d been planning for this morning so I could bring this sermon. It’s an important 50th anniversary reflection with implications for who we are as Unitarian Universalists today. A caveat: the story I will now tell you focuses on relationships between White UUs and African American, African Diaspora and Black UUs. That is, the racial dynamics in the story have to do with the place of African Americans in our larger White denomination in the late 1960s. The risk in telling this story is that we forget that Black people are not the only People of Color within Unitarian Universalism. There are Native American, Latinx, Asian, Middle Eastern, South Pacific Islander UUs, not to mention biracial and multiracial UUs. Their stories aren’t in the story I am about to tell. I’m naming this simply so that we don’t forget our denominational story about race is not an exclusively Black-White story. The story of race in our faith from 1967 to 1970 is complex. It’s the story of a historically White denomination encountering its own institutional racism when it wasn’t prepared to do so. It’s the story of people dedicated to a vision of racial integration and the nonviolent principles of the Civil Rights movement coming into conflict with people dedicated to the Black Power movement and the principle of Black self-determination. It’s the story of the democratic principle at the heart of our faith coming into conflict with the justice principle at the heart of our faith. In the words of the historian of African American Unitarian Universalism, the Rev. Mark Morrison-Reed, it’s a tragic story. Over the first weekend of October,1967, the UUA convened an “Emergency Conference on the Unitarian Universalist Response to the Black Rebellion.” 140 delegates from around the country gathered at the Biltmore Hotel in New York City. 37 of them were Black. As the conference got underway, 30 or so Black delegates withdrew into a private room, forming what eventually became the Black Unitarian Universalist Caucus. They created a list of nonnegotiable demands which they presented to the Emergency Conference, asking that they be accepted or rejected without debate. The core demand was that the UUA create a Black Affairs Council and fund it for four years at $250,000 /year (that’s over $7 million today). The Black Caucus would select the Black Affairs Council members who would have complete control over the money. As for the remaining Conference participants, some left in dismay. Many who were used to certain norms for the conduct of meetings were unnerved that the Black Caucus had upended those norms. Many who, just a few years earlier had joined Dr. King in Selma for the Voting Rights march, and who had dedicated their lives to the Civil Rights movement, were bewildered that young, Black UU activists critical of Dr. King and the limits of nonviolence had overtaken their agenda. Some of those Black delegates who refused to join the Black Caucus reported feeling criticized and pressured for their decision. Nevertheless, the tactics worked. More than two thirds of the conference delegates supported the demands and agreed to communicate them to the UUA Board. Black Power had arrived in Unitarian Universalism. UUA President, Dana McClean Greeley, wrote “They wish to form a Black Power organization … within the denomination. This will not be a perfunctory or easy discussion.” Sure enough, later that fall the UUA Board rejected the idea of a Black Affairs Council and proposed a much less ambitious approach to Black empowerment. The Black Caucus countered with a call to congregations to stop paying their denominational dues. Tension grew throughout the year, but the Black Caucus never altered its demands. The following May, at the 1968 UUA General Assembly in Cleveland, just seven weeks after Martin Luther King’s assassination, after extensive, painful debate, delegates adopted a resolution creating the Black Affairs Council and funding it with $250,000 a year for four years. The vote was 836-347. This was an extraordinary victory for Black Power within Unitarian Universalism. Once it was established, the Black Affairs Council began funding black-led organizations around the country that were addressing political repression, economic exploitation, and what they called educational and cultural nondevelopment. The list of organizations is long: the Black Community Fund of Philadelphia, the Center for Black Education, Washington, DC, the Coordinating Committee of the Black Community, Lawrence, KS, the Malcolm X Center of Los Angeles, Malcolm X Liberation University, Greensboro, NC, National Democratic Party of Alabama, the National Association of Afro-American Educators, the Congress of African People, and many more. Through the Black Affairs Council, Unitarian Universalist money and people reached deep into the heart of radical Black America. The victory didn’t last. There were countervailing forces. UUs who were committed to pursuing racial justice work in a more traditional, racially integrated way had established their own organization in early 1968, Black and White Alternative or BAWA. They also wanted UUA funding. Black Caucus leaders understood this trend, I think correctly, as the unwillingness or inability of some White UUs and some Black UUs to embrace the goal of Black Power and Black self-determination; or worse, as the need of some White UUs to maintain control over racial justice efforts. The Black Caucus warned that if BAWA received funding, they would disaffiliate from the UUA. The divisions were bitter. People describe strong-arm tactics, name-calling, even spitting in opponents’ faces. Later that fall, facing a funding crisis, the UUA Board reduced the Black Affairs Council annual allocation, spreading it over five years. In response, the Black Affairs Council disaffiliated. At the 1970 Seattle General Assembly, delegates voted to discontinue funding entirely. Although the Black Affairs Council received funding from other sources and functioned for a few more years, the promise of the 1968 Cleveland vote went unfulfilled. Many people of all racial identities left Unitarian Universalism in response to these events. The pain, anger and heartbreak still reverberate through our faith fifty years later. I don’t know how I would have responded had I been there. It would have been excruciating to witness the disruption of our democratic process. It also would have been excruciating to recognize that Black UUs felt so frustrated and enraged at the lack of vision, urgency and engagement on the part of the larger institution that they needed to assert themselves and demand Black Power. Democracy is a deeply-held, sacred principle for us. That doesn’t mean the democratic processes we use are perfect. There are times when our processes may actually limit our vision, curtail our thinking, and exclude certain voices. Sometimes it takes a disruption to realize this. When people who live under some form of oppression gather together, organize and say ‘this is what we need,’ even ‘this is what we demand,’ I’ve learned not to react defensively but to remember MLK’s words. “‘Wait’ has almost always meant ‘Never.’” If we’re being called to act for justice now, let’s act now. There are risks, yes. But for me, that’s accountability. That’s solidarity. That’s honoring the inherent worth and dignity of every person. That’s justice, equity and compassion in human relations. And though it may disrupt our current democratic process, hopefully it will inspire us to evolve our process, to make it more responsive to the pain, suffering, needs and demands of oppressed people. The BLUU story is still unfolding. In critical, if uncomfortable ways, BLUU is impacting power dynamics within Unitarian Universalism. It’s raising an important question: Can White UUs and White UU congregations truly hear and respond to the aspirations of Black UUs and other UUs of Color? And at a deeper level, BLUU is building a visible, robust, faithful, exciting, and permanent home for Black Unitarian Universalist identity and spirituality. First, let’s continue our work with Moral Monday CT, our primary Black Lives Matter organizing partner. Then, BLUU has asked that UU congregations provide space to Black-led social justice organizations. Let’s take this seriously. I’m proud to announce that we are beginning to build a relationship with the Manchester-based Minority Inclusion Project, an organization that helps non-profits address institutional racism. Then, to reach the $5,3 million funding goal for BLUU, the UUA has asked all congregations to participate in a program called “The Promise and the Practice of our Faith,” which raises $10 per congregational member. We began our participation in that through our community outreach offering in January. We’ll need further conversation about how to fully meet this goal, which the UUA understands as a commitment to countering our own White Supremacy culture. Then, for the fiftieth Anniversary of the Black Affairs Council, Mark Morrison-Reed has written a new book called Revisiting the Empowerment Controversy. As part of our fiftieth anniversary year, let’s read this book as a congregation this spring. I will also recommend, at the suggestion of Ollie Cohen, that we read the Beacon Press book and New York Times bestseller, White Fragility by Robin DiAngelo. Finally, I’d like to help establish a People of Color Caucus at UUS:E. It would admittedly be a small group, but with the right support and funding, I think such a caucus could generate some amazing ideas for the future of this congregation. It would be a shame for those ideas to never come to life. The struggle continues. Let’s be in it. Amen. Blessed be. I’m basing my retelling of this story on the UUA’s 1983 Commission on Appraisal Report, “Empowerment: One Denomination’s Quest for Racial Justice,” and Carpenter, Victor, “The Black Empowerment Controversy and the Unitarian Universalist Association, 1967-1970, both in Unitarian Universalism and the Quest for Racial Justice (Boston: UUA, 1993); Ross, Warren R., The Premise and the Promise: The Story of the Unitarian Universalist Association (Boston: Skinner House Books, 2001) pp. 41-56; and Morrison-Reed, Mark, “The Empowerment Tragedy,” UU World Magazine, January 16, 2012, see: https://www.uuworld.org/articles/empowerment-tragedy. Quoted in Unitarian Universalism and the Quest for Racial Justice, p. 26. Quoted in Unitarian Universalism and the Quest for Racial Justice, p. 102. King, Jr., Martin Luther, “Letter from a Birmingham Jail,” April 16, 1963. See: https://www.africa.upenn.edu/Articles_Gen/Letter_Birmingham.html. McCardle, Elaine, “UUA Board of Trustees commits $5.3 million to Black Lives of UU,” UU World Magazine, October 17, 2016. See: https://www.uuworld.org/articles/board-commits-5-million-bluu. Explore the BLUU website at http://www.blacklivesuu.com/. Explore the Minority Inclusion Project website at https://ctmip.org/. Learn more about “The Promise and the Practice of our Faith” at https://www.uua.org/giving/areas-support/funds/promise-and-practice. Past, present, future. This sermon is about time travel. In the absence of an actual time machine, how do we visit the past? How do we visit the future? The sankofa bird isn’t a time machine. It is an assertion that the act of visiting matters. I am an admirer of UCONN physics professor Ron Mallett, who convinces me time travel is possible—in theory certainly and, perhaps one day, in practice. I want to share with you a clip from a lecture he gave a few years ago. The lecture outlines his book, Time Traveler: A Scientist’s Personal Mission to Make Time Travel a Reality. I love Professor Mallett’s questions: “Who of us has not wondered what’s going to happen in the future, what’s going to happen next? Or thought about the past, maybe to visit some significant historical event, or … to change something in our lives?” These are human, spiritual questions. They might emerge in us from any number of sources: curiosity, wonder, anxiety, fear. For Professor Mallett they emerge out of a ten-year-old’s potent grief, a desire to see his father again, to maybe save his life. There’s a sankofa dimension in Professor Mallett’s pursuit of time travel. Go back and get it. Go back and retrieve what was lost, that precious egg. Throughout his career he has been looking back—while his feet have faced forward, while he’s studied the impact of black holes on time, the intricacies of circulating light created by strong lasers. He’s produced no time machine, but his backward look has motivated him to advance human understanding, thereby shaping the future, and possibly inspiring some as-yet-unborn savant to build the machine he longs for. Who’s to say his father’s life won’t yet be saved? Go back and get it. I have been exploring Monáe’s music all summer, including the videos (she calls them ‘emotion pictures’) that accompany her songs with an amazing science fiction story. In a sense she really hasn’t been human until now. She’s been writing, performing and appearing in emotion pictures as a rebellious, time-traveling, messianic android named Cindi Mayweather. In the futuristic city of Metropolis, sentient androids serve humans—they’re essentially slaves—an explicit metaphor for racism, sexism, homophobia and other forms of oppression in our society. Cindi Mayweather becomes fully aware of her oppression when she illegally falls in love with a human, gets caught, and is slated for disassembly. She fights back, leading a nonviolent rebellion against the Great Divide, a secret society that uses time travel to suppress freedom and love across eras. Deploying the weapons of music, dance, inclusion and love, her rebellion seeks to unite androids and humans as equals. While all these temporal boundary-crossings are happening in the emotion pictures, Monáe’s music seamlessly crosses boundaries between styles and eras. She combines the sounds not just of R&B, soul, hip hop, funk, spirituals, jazz and big band which we associate with Black artists, but psychedelic rock, Broadway, European classical music and movie soundtracks. The opening song on her new album is a collaboration with Brian Wilson of the Beach Boys–possibly the whitest band of all time! She wants her audience to cross boundaries as well. She used to hand out a pamphlet at her concerts called “Ten Droid Commandments.” The seventh commandment read: “Before the show, feel free to walk about the premises impersonating one of the many inspirations of the ArchAndroid Emotion Picture: … Salvador Dali, Walt Disney, Outkast, Stevie Wonder, Octavia Butler, David Bowie, Andy Warhol or John Williams.” Artistically she goes back again and again to recover the past, weaving it into a present expression that envisions a compelling future. In a sense, she doesn’t need a time machine. She is a time machine, driven by a potent yearning to manifest humanity’s interconnectedness through music—and to invite her audience to manifest it with her. It’s another version of sankofa: redeem the past by transcending its divisions in the present. In so doing, create a future that enables people to exist beyond labels and stereotypes, to freely live multiple, intersecting identities, to be creative, to be whole. There is much at stake in the act of visiting past and future. Some critics and scholars classify Janelle Monáe’s art as Afrofuturism, an artistic movement that imagines Black people and culture in the future. One might think there’s nothing extraordinary about that. Of course there will be Black people and culture in the future.’ But that doesn’t account for a historic lack of Black and other People of Color characters, world-views and stories in our most culturally prominent future visions, especially in science fiction and fantasy. In her book, Afrofuturism, scholar and sci-fi writer Ytasha L. Womak says: “Even in the imaginary future—a space where the mind can stretch beyond the Milky Way to envision routine space travel, cuddly space animals, talking apes, and time machines—[when] people can’t fathom a person of non-Euro descent a hundred years [from now], a cosmic foot has to be put down.” Afrofuturism puts that foot down. Womak discusses various lineages of black artists—sci-fi and fantasy writers like Octavia Butler; musicians like Sun Ra, George Clinton and Janelle Monae; visual artists, poets, deejays, film-makers, museum curators, conference organizers—people who imagine Black and other peoples of color in the future through their artwork. This comes in response to dominant culture futurism’s failure to imagine Black and other peoples of color in the coming centuries or in imaginary, fantasy settings. In populating the future with Black people, Womak says “Afrofuturism unchains the mind.” It liberates the imagination, liberates creativity. When a person can imagine themself in the future—even a wild, seemingly impossible future, or a dystopian, post-apocalyptic, zombie-infested future—it generates hope, resolve, and action. But Afrofuturism also looks back. Womack points to artists who refer to their ancestors, or to the ancient histories, mythologies, and cultures of the African continent. She quotes poet Khari B., who says, “It’s the sankofa effect…. One step into the future while looking back…. We’re evolving using the strength and characteristics of things that [brought us to where we are today]. We … pull from our past to build our future.” Go back and get it! I want to leave you with three thoughts regarding how Afrofuturistic time travel might influence a historically white culture Unitarian Universalist congregation. First, as a person descended most recently from White, European ancestors, it feels critical to me to approach Afrofuturism, as well as sankofa, deeply aware of the ways in which White, European culture historically has—and even today continues to—misunderstand, misrepresent, belittle, denigrate, appropriate, steal, and at times, destroy the cultural expressions of non-European cultures. The short-hand for this is ‘cultural racism.’ Mindful of it, I’m digging deeply into Afrofuturism, stiving to do so with the utmost humility and reverence. Second. We live in the future’s past. contemplate that for a moment. Since we live in the future’s past, what is our responsibility for creating a future worthy of our principles—one that corrects the flaws of white supremacy, patriarchy, heterosexism and environmental injustice? One that is inclusive, loving, joyful? Womak says “the idea of time travel, oddly enough, reemphasizes the present.” That is, given the future we imagine, how should we act now? Who should we be today so that a loving, inclusive future becomes a reality? I read to you earlier from the hip-hop artist Gabriel Teodros’ story, “Lalibela.” Teodros has a spoken word piece called “Colored People’s Time Machine,” in which he acknowledges, “I’m the future ancestor to my unborn seeds.” He means we need to be conscious, aware, accountable to the people who are coming after us. We want them to come back and get us, to bring us into their present so that our example can help them shape their future. That’s time tavel. Finally, I talked about the way Janelle Monáe collapses the boundaries between past, present and future in her music. Gabriel Teodros makes a similar statement in “Colored People’s Time Machine.” He says “Everything’s happening at once, right?”  The more human beings consciously travel in time—remembering and imagining, remembering and imagining, remembering and imagining—the more the boundaries between past, present and future actually disappear. Maybe they were never real in the first place. Maybe they are just illusions our minds create to make sense of our existence. Teodros continues: “ I see it in moments and I feel it in dreams / and it would be so easy If I could let go of me. / It’s a constant process unravelling / You call it hip hop, I call it colored people’s time machine. / Made of music you feel what you don’t see, / I ride the vessel, the vessel is also me.” Arriving at that kind of enlightenment—that sense of oneness in time and space—is the goal of many spiritual practices. Sankofa suggests yet another approach. Go back and get it. Bring it forward. Shape the future by living well in the present. Ride the vessel, knowing you are the vessel. For a general statement about Sankofa, see the article “Sankofa, What Does it Mean?” at the blog Sankofa: Filling the Digital Divide, Feb. 15, 2013: https://lnwatsonblog.wordpress.com/2013/02/15/sankofa-what-does-it-mean/. For a general statement about adinkra, see the article “Adinkra Symbols” at the blog An Afroetic Narrative, 2016: https://afroetic.com/adinkra-symbols/. Also see reflections on sankofa and the sankofa bird in Womack, Ytasha L., Afrofuturism: The World of Black Sci-Fi and Fantasy Culture (Chicago: Lawrence Hill Books, 2013) pp. 160-161. Mallett, Ron L., Time Traveler: A Scientist’s Personal Mission to Make Time Travel a Reality (Basic Books: New York, 2009). UConn Talks, “Time Travel Fueled by Love,” with Professor Ron L. Mallett. See: https://www.youtube.com/watch?v=etJv4yTY4Ig. Spanos, Brittany, “Janelle Monáe Frees Herself,” Rolling Stone, Issue 1313/1314, May 17-30, 2018, pp. 34-36. See: https://www.rollingstone.com/music/music-features/janelle-monae-frees-herself-629204/. Sterritt, Laura, “Janelle Monáe’s Hidden Sci-Fi Epic,” Transchordian, October 24th, 2013. See: http://www.transchordian.com/2013/10/metropolis-janelle-monaes-hidden-sci-fi-epic/. Also see Womak, Afrofuturism, pp. 74-76. View further analyses of Janelle Monáe’s work at https://www.youtube.com/watch?v=RMqng3HmPOA and https://www.youtube.com/watch?v=jdylle_hPgQ. Pulliam-Moore, Charles, “From Metropolis to Dirty Computer: A Guide to Janelle Monáe’s Time-Traveling Musical Odyssey” at io9 We Come From the Future (Gizmodo), May 2, 2018. See: https://io9.gizmodo.com/from-metropolis-to-dirty-computer-a-guide-to-janelle-m-1825580195. View the emotion picture for Janelle Monáe’s “Many Moons” at https://www.youtube.com/watch?v=LHgbzNHVg0c. Listen to Janelle Monae’s “Dirty Computer” featuring Brian Wilson on Yutube at https://www.youtube.com/watch?v=oFK6k-pvXmI. Womak, Afrofuturism, p. 7. Incidentally, Ytasha Womak is the creator of Rayla 2212—a multimedia series with music, books, animation and games that follows Rayla Illmatic … a rebel strategist and third generation citizen of Planet Hope, an Earth colony gone rogue some two hundred years into the future. 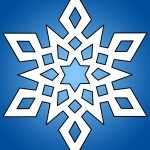 Check out: http://rayla2212.com/welcome-to-the-world-of-rayla/. Teodros, Gabriel, “Lalibela,” in Brown, Adrienne Maree and Imarisha, Walidah, eds., Octavia’s Brood (Oakland: AK Press, 2015) pp. 123-133. Tedodros, Gabriel, “Colored People’s Time Machine.” See: https://www.youtube.com/watch?v=cuIxAkZXsKI. 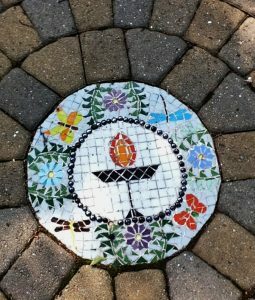 Unitarian Universalist Society: East will be home to a spiritually alive, richly diverse and growing congregation. We will send forth energy, spirit and strength into our beloved communities. We will love, be present to suffering, comfort, heal, bear witness to oppression, and boldly work toward social and environmental justice. The word ‘love’ jumps out at me. There’s a story about why love appears in the statement. I want to share it with you. Though I preface my sharing with a concern, which is that, we Unitarian Universalists—and many people of liberal faith—along with the wider culture more generally—tend to gloss over love, are often imprecise in our naming of it. We’ve drained love of it of meaning, have allowed it to become a cliché. This is so true that it is even cliché for a minister to tell you that love has become cliché!” (Just want you to know that I know that.) We each understand love in our own way, yet we rarely, if ever, pause in the course of our congregational life to examine what we actually mean by love, what the various dimensions of love are, and perhaps most importantly, how we demonstrate love with our actions. You may remember last May, approximately seven hundred Unitarian Universalist congregations participated in White Supremacy Teach-Ins, mostly on Sunday mornings. You may remember the Teach-Ins came in response to allegations of White Supremacy culture operating at the Unitarian Universalist Association in Boston. A number of high-ranking UUA staff members resigned over concerns about racism impacting hiring decisions. It was a very painful time. That pain continues as Unitarian Universalism continues to wrestle with race and racism. I preached a sermon last May about White Supremacy culture. Among other things, I said that while White UUs aren’t White supremacists, our culture, especially when we fail to examine it closely, can produce racist outcomes. This is true of any culturally White institution. Often we don’t recognize it unless someone courageously makes us aware of it. Yes. The answer was and is “yes.” I loved that Alan had encountered my words, had not felt defensive, but rather, had been moved to re-think, or at least question, a congregational process. Could we somehow perpetuate racism if we don’t think this through more closely? We started to think it through more closely. We ultimately decided to invite five prominent People of Color leaders from the Greater Hartford region—all people with whom we have some degree of relationship—to speak to our leadership prior to our visioning work. We wanted their perspectives as People of Color leaders to inform and deepen our visioning process. We asked them, “What is your vision for Manchester and Greater Hartford?” And, “How can our congregation contribute to the fulfillment of that vision?” Did this guarantee that our process would be completely free from that unconscious, unintentional racism we’re naming when we talk about White Supremacy culture? No. But this was an anti-racist way to approach our visioning process. But the rest of me said “Yes. She’s right. This isn’t about the words on paper. This isn’t ultimately about the final vision statement. This is about the abiding, living, active love that must reside at the foundation of our life together. It cannot be glossed over. It needs constant nurture and attention; and especially in a congregation that has such a long and enduring Humanist identity, it begins with and is rooted in love of self. What an incredible invitation Pamela was making to us. In the list of sources for our UU living tradition we identify “Jewish and Christian teachings which call us to respond to God’s love by loving our neighbors as ourselves.” In the Bible I find this most clearly stated in Jesus’ response to the question, ‘which commandment is the first of all?’ He condenses centuries of Jewish teaching and prophetic witness into a few, short, enduring phrases: “The first is, ‘Hear, O Israel: the Lord our God, the Lord is One; you shall love the Lord your God with all your heart, with all your soul, with all your mind, with all your strength.’ The second is this, ‘You shall love your neighbor as yourself.’ There is no other commandment greater than these.” Regarding that second commandment, in my experience, we tend to focus on the neighbor part. We actually ask ourselves frequently, in a variety of ways, “Who is our neighbor?” “How can we work in solidarity with our neighbor?” “How can we more fully welcome the stranger, the alien, the other?” This afternoon we decide as a congregation whether or not to offer sanctuary to immigrants facing deportation. That is ultimately a question of who our neighbors are. Essential questions! But how often do we pause to reflect on the “as yourself” part? That’s an essential question too. The love we offer our neighbor mirrors our love for ourselves. 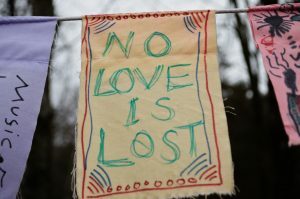 Yet, if we don’t reflect deeply on the quality of love we feel for ourselves—if we just assume that everybody feels love for themselves, so that rather than exploring it we gloss over it, take it for granted, turn it into a cliché—how do we really know the nature of the love we ought to be extending to our neighbor? When I read in our proposed vision statement the phrase, “we will love,” I recall Pamela’s invitation to love ourselves. In addition to extending love to our neighbor, I read in this phrase an invitation for us to unapologetically take a deep inward look, for each of us to unabashedly explore, experience and name the love we each feel for ourselves; and then for us as a congregation to unabashedly and proudly explore, experience and name the love we feel for ourselves as a congregation. We do this so that the love we offer to each other and into the world is authentic, powerful, and transformative. This inward look is hard. Genuine love of self is hard. Mary Bopp told me a story this week about a minister she worked with in a previous congregation, who said “of course everybody loves themselves.” Mary said “that’s not true. It’s not as easy as you think.” He said, “sure it is.” She said, “ask your wife if it’s easy.” Apparently he asked his wife, who told him about how women are often socialized to care for others above themselves, and how the capacity for self-love is then easily dampened, suppressed or lost as a result. My point is that I didn’t intuitively identify self-love as a reason for acting. So many people struggle with cultivating self-love. So many people for so many reasons feel, at some level, unworthy, not good enough, guilty, ashamed, weak. Unitarian Universalism isn’t always helpful here. We have a perfectionist streak running through our history. That may have been what Pamela Moore Selders was sensing when she said “I want you to love yourselves like I love myself.” We don’t always recognize our perfectionism, but it’s there. It has roots in our Puritan, New England spiritual heritage. It’s more visible among our Unitarian forebears, but the Universalists had their perfectionist leanings too. It’s part of American culture, capitalist and industrial culture. We witness it in the unrelenting drive for efficiency, for increased production, profit, growth, or in the words of the 19th-century Unitarian theologian, James Freeman Clarke, in the “progress of mankind onward and upward forever.” So often we unconsciously measure ourselves against some perfect ideal, and find ourselves lacking. Self-love is hard when perfection is the default. I wrestle with perfectionism. I feel like I fail often—as a parent, a husband, brother, son. I stumble often as a minister. Did anyone notice? Are they disappointed? I hope not. I second-guess myself. Was that the right thing to say? Is this the right sermon to preach? I know what needs to be done, but I’m not doing it because I’m doing something else that’s taking too much time. Do I have my priorities right? Are people thinking I don’t have my priorities right? Will the people respond well to what I say? Why am I so nervous? I wake up at 2:00 AM, my mind racing about the annual appeal, the worship service, why too few people are volunteering for leadership positions, the person in the hospital I forgot to call. When I wake at 2:00 AM, is there any love in there? Do I love my hair? My skin? Do I love my culture, my food, my art? Maybe the things on Pamela’s list aren’t the things on my list. But I do have a list. I love my sense of rhythm, that I can sit down at a drum set and drum. I love my Polish and Pennsylvania Dutch heritage; I love my creativity, my connection to nature, my ability to speak in public, my courage, my non-defensiveness, my ability to apologize, my experience of a sacred dimension in my living. I love how I love that sacred dimension. I love my wife, my children, my family, my friends. I love that they love me. I love that I’m a Unitarian Universalist. I love serving as your minister. If I strive to do all of it with perfection, measuring the results against some ideal standard, then I grow anxious and will likely fail. But if I can just revel in the love I feel, be present with it, surrender to it, love myself—ahh!—now I’ve got a solid foundation from which I can love my neighbor. Now I’ve got some sense of how I am called to love the world. Members and friends of this congregation: What’s on your list? How deeply do each of you love yourselves? Can you put words to it? Can you describe it? I know it is very difficult for some of you. Sometimes the self-doubt, the feelings of unworthiness are powerful. Do you know what gets in the way of deep self love? How are you actively addressing it? And even if it isn’t difficult, we still don’t typically speak of the ways we love ourselves. There’s something counter-intuitive about it, it feels selfish, self-absorbed. But I want us to feel invited to speak of it, because it is the foundation upon which we love our neighbor. Furthermore, what is on your collective, congregational list? What do you love about this congregation? Can you say it with pride? Can you celebrate it? What do you love about your minister? Can you tell him? Can he tell you what he loves about you? Can you make abundant room for that conversation? It is indeed prelude to loving our neighbor. This is my challenge to you: Make your lists. Share them with each other. A bold and heart-filled love of ourselves matters. It is certainly not the end of our journey, but an essential beginning. It is not selfish or self-absorbed, but an essential part of the foundation upon which we build our future together. And from that foundation, we can go out into the world, knowing so much more clearly how to bless it, how to witness its pain, challenge its injustices, and work for healing and justice. I need you to love yourselves like I love myself. May you make compelling lists—not of the things you must do, but of the depth of your love: for yourselves, for each other, for the world. May love of self become the source of your deep compassion for yourself, for your neighbor, for the world. Pawelek, Rev. Joshua Mason, “White Supremacy Teach-In,” a sermon delivered to the congregation of the Unitarian Universalist Society: East, Manchester, CT, May 7, 2017. See: http://uuse.org/white-supremacy-teach-in/#.WvxAw4gvxPZ. In the summer of 1984 my family spent two weeks in Poland. 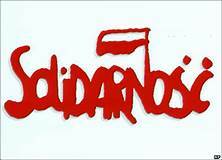 We arrived a year after Poland’s communist government had lifted martial law, which it had used to cripple the nearly ten million member Independent Self-governing Labor Union, Solidarity. Although it had been banned and political repression was widespread, Solidarity continued to operate underground. Most people we encountered were openly critical of the government. They were extraordinarily hopeful that not only the Polish government, but the Soviet Union would soon collapse under the weight of the human yearning for freedom. On our last weekend in Gdansk we worshipped at St. Bridget’s, whose priest, Father Henryk Jankowski, had famously served the Eucharist to striking shipyard workers. Inside that sanctuary you would never know the country was facing political repression. The standing-room-only congregation was on fire, spiritually alive, vibrant, free. I will never forget that congregation singing its closing song, every right hand raised in the air, making a V for victory. It was as if the kingdom had come. Later that year, October, 1984, this lesson deepened as the world received news that secret police had murdered Poland’s most outspoken anti-communist priest, Father Jerzy Popieluzko—a sobering reminder that in siding with the people, the church and its leaders may become victims of the very oppression they seek to resist. Fast forward a decade to my first year in seminary. I registered for a class called “The Church and European Revolution,” imagining it would give me insight into the historical trends that informed the Polish Church in the 1980s. I wanted to understand more fully how churches have been involved in struggles against oppression over the centuries. What I learned, instead, is that the Polish model is exceedingly rare. It seemed that through all of modern European history, the church, whether Catholic or Protestant, was inevitably in league with the ruling powers and resisted revolutionary impulses rising up among the people. The church executed—or sanctioned the execution of—its own priests or ministers if they took revolutionary stances. A notable example comes from the German Peasants War of the mid 1520s. While the towering Protestant Reformer, Martin Luther, sided with the German princes and called on the peasants to cease their uprising, the radical, apocalyptic preacher and theologian Thomas Müntzer became a leader of the peasants’ revolt. He was eventually captured, tortured and executed. In those countries where revolutions succeeded in toppling the ruling powers, most notably France and Russia, the churches were so thoroughly linked to the ruling powers that they became the primary targets of revolutionary violence. It’s a tale of two churches. On one hand there is the church of the struggling people, the church that seeks liberation, justice, freedom; the church that reads the Beatitudes—‘Blessed are you poor”—and takes them to heart; the church that encounters the Hebrew prophets’ call to “loose the bonds of injustice … to let the oppressed go free”—and takes them to heart. On the other hand, there is the church that identifies with the powers that be; the church that shies away from prophetic words and deeds so as not to upset the status quo; the church that looks away from oppression and is, by omission if not commission, complicit with unjust systems that trap and impoverish people. From one angle, it’s hard to argue this congregation, and Unitarian Universalism nationally, has abdicated its responsibility. This church was deeply involved in Connecticut’s campaigns for marriage equality and legal protections for transgender people. We were deeply involved in the passage of an environmental justice bill in 2008; in campaigns for criminal justice and drug policy reform to challenge mass incarceration of people of color; in campaigns for better health care, domestic worker rights, and educational reform; in the work of refugee resettlement; in support of Black Lives Matter. In that regard, Stan isn’t referring to us when he speaks about faith communities abdicating. If he is, Sue [McMillen] might take issue with him. Afterall, she was a member of the City Line Dozen who were arrested in Hartford on October 5th, 2015. 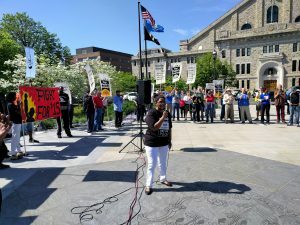 As a person of faith, supported by her congregation and her minister, she was protesting stark income inequality between residents of Hartford and those of the surrounding suburbs. From another angle, however, one could argue our efforts have been woefully insufficient, our arrests largely symbolic. One could argue our pulpit messages have not adequately moved us to the kind of mass action necessary to change the direction of the nation, nor have they moved us to honestly examine our own complicity in systems of oppression. Now, poverty is increasing; the war economy is escalating; movements against women’s reproductive rights, gay and lesbian civil rights and protections for transgender people are gaining ground; movements to restrict voting rights, to end consent decrees intended to reduce police violence, to privatize and build more prisons are gaining ground; movements to transfer wealth from all economic classes to corporations and the wealthy elite are prevailing; movements to undue years of environmental protections and regulations intended to reduce the scale and pace of climate change are gaining ground. I know you know this. I know you have many feelings about this—from fear and despair, to outrage, to commitment and resolve, to unquenchable hope. I know so many of you want to be part of the solution, but are unsure of your capacity, of your ability to pursue confrontation. You are legitimately concerned that the more firmly we position ourselves in the breach, the more risky our religious life becomes. Might we become targets of hate? That possibility is always present. But we cannot let hate win. When leaders of color from Greater Hartford spoke to our leadership last fall in preparation for our work of creating a new congregational vision statement, they told us they need us to lead with love, and to be bold! Now is a time for love and boldness. This is why I fully support this congregation providing sanctuary to immigrants seeking to avoid deportation. Not only will sanctuary help salvage the lives of individuals who take shelter with us; we will be sending a message to Manchester, Connecticut, ICE and the White House that it is morally wrong to destroy families, communities and local economies through a policy of indiscriminate and widespread deportations. This is also why I feel called to participate in the relaunching of Martin Luther King Jr.’s 1968 Poor People’s Campaign. From Monday, May 14th, through to the end of June, the Rev. Dr. William Barber of Repairers of the Breach, the Rev. 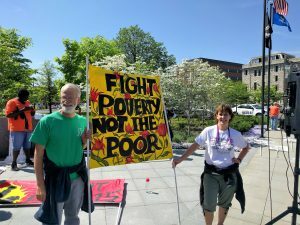 Dr. Liz Theoharris of the Kairos Center, and the leaders of many denominations, including Unitarian Universalist Association president, Susan Frederick-Gray, have called for a massive, nationwide campaign of nonviolent civil disobedience to draw attention to the plight of the nation’s poor. Let me quote Dr. Barber’s comments about the campaign in a recent article. Note, as an evangelical Christian he offers a searing critique of evangelical Christian—one that also applies to any church that fails to act on its own principles. “People are poor not because they are lazy, not because they are unwilling to work hard, but because politicians have blocked living wages and healthcare and undermined union rights and wage increases. Our nation’s moral narrative is shaped by Christian nationalists whose claims run contrary to calls in the Scripture, which is very clear that we need to care for the poor, immigrants and the least among us. If you claim to be evangelical and Christian and have nothing to say about poverty and racism, then your claim is terribly suspect. There needs to be a new moral discourse in this nation – one that says being poor is not a sin but systemic poverty is. [Our] Moral Agenda demands … major changes to address systemic racism, poverty, ecological devastation, the war economy and our distorted moral narrative, including restoration and expansion of the 1965 Voting Rights Act, repeal of the 2017 federal tax law, implementation of federal and state living wage laws, universal single-payer healthcare and clean water for all. To make sure these demands are heard, poor and disenfranchised people from coast to coast are preparing for 40 days of action centered around statehouses and the US Capitol. 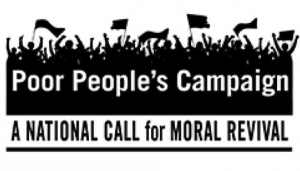 Over six weeks this spring, people of all races, colors and creeds are joining together to engage in nonviolent moral fusion direct action, massive voter mobilization and power building from the bottom up…. We will by publicizing times and locations for campaign trainings—including here next Saturday afternoon—and actions in Connecticut. I am planning to travel to Washington, DC on Sunday, June 10th, in order to participate in the campaign on Monday, June 11th. I’m looking for travelling partners! It’s a tale of two churches. Certainly, we can point in any direction and find churches whose members are failing to heed the teachings of their own scriptures. And we can point at ourselves and discover similar failures. That abdication of responsibility has always been a feature of the religious landscape. But that other church—that justice-seeking, prophetic church, that inherent worth and dignity church, that welcome the stranger and the immigrant church, that loving church, that bold, courageous church—that’s a part of the landscape too—and it is about to reveal itself, once again, to a nation hungering for its vision. Yancy, George, “Is Your God Dead?” New York Times, June 19, 2017, See: https://www.nytimes.com/2017/06/19/opinion/is-your-god-dead.html. Dyson, Michael Eric, “We Forgot What Doctor King Believed In,” New York Times, April 1, 2018. See: https://www.nytimes.com/2018/03/31/opinion/sunday/martin-luther-king-faith.html. Barber, William, “American Once Faught a War Against Poverty, Now it Wages a War on the Poor,” The Guardian, April 15, 2018. See: https://www.theguardian.com/commentisfree/2018/apr/15/poor-peoples-campaign-systemic-poverty-a-sin?CMP=Share_AndroidApp_Gmail. “That distillation of soul—which of all possessions is most precious—comes, if we are faithful, out of sorrow.” A challenging and hopefully liberating idea from the late Unitarian Universalist minister, the Rev. Nancy Shaffer.” Soul—that part of you that is most uniquely you; that part of you without which you would not be you; that part of you that is most genuine, most authentic, most vital, alert, energized, creative, passionate, generous and good; that often hidden part of you that nevertheless springs up from the deep wells of your being in intuitions and insights, ahas and eurekas, amens and hallelujahs. “That distillation of soul—which of all possessions is most precious—comes, if we are faithful, out of sorrow.” Out of sorrow. A challenging and hopefully liberating idea. Rev. Shaffer never shied away from sorrow. So often her words ache with sadness, longing, grief—her own, yes; but she also gives voice to the sadness, longing and grief that lie at the heart of so much human experience. She doesn’t wrap sorrow up in tidy, neat packages, as if to say, ‘there, we’ve fixed that problem, let’s put it on the shelf and move on.’ She doesn’t offer those spirit-killing clichés—‘everything happens for a reason,’ ‘it’s all part of God’s plan,’ ‘whatever doesn’t kill you makes you stronger.’ She knows sometimes there simply is no reason for the awful things that befall a person, a congregation, community a country; and some things happen that no decent God would ever plan; and sometimes the things that don’t kill us nevertheless stay with us, stay in our bodies, leave us feeling weakened, deflated, sorrowful. She doesn’t shy away from sorrow, and that’s important. These days are full of it. For a moment, consider nothing in the wider world. Just consider this congregation. Five long-time members, deeply loved, deeply embedded in the social fabric of this spiritual community, have died in recent months: Nancy Parker, Carolyn Kolwicz, Johanna Conant, Bruce Hockaday and, just this week, Lynn Kayser. Also this week, Pedro Colquicocha, the long-time partner of UUS:E member David Lacoss, died after removal from life support. Those of you who are newer to UUS:E may not have known any of these beloved members of our congregational family, but you will likely sense the sorrow flowing through these halls. And it may be that I’m just returning from sabbatical, and thus it feels to me that there is a greater-than-usual number of pastoral challenges greeting me all at once; but I don’t think I’m overstating it when I say there are a plethora of difficult, sorrowful events in many of your lives: the deaths of parents, mental health crises, cancer. Some of you are entering into very difficult life transitions, making hard decisions. Some of you have children who are struggling. Perhaps not as sorrowful, but challenging and anxiety-producing nevertheless, some of you are recovering from surgeries, while others are preparing for surgeries. Just here, within these walls, so many sources of sorrow. Do I dare shift our attention to the wider world? We pray for the Parkland, FL mass shooting victims and their families. We pray that the survivors may find comfort, solace, peace. We pray for the shooter that he will somehow find release from whatever demons torment him. We pray for an end to the insanity of gun violence in our nation. We pray, knowing—because we’ve prayed so much, for so many victims and their families, for so many shooters, for so many first responders, for so many communities, including Manchester, CT after the 2010 Hartford Distributors shooting—we pray along with tens of millions of our fellow Americans—we pray, knowing from experience, that our prayers, our vigils, our candles lit, our quiet songs of mourning and hope, are insufficient to address the magnitude of this scourge. October 2nd, 2017 was the first day of my sabbatical. That was a Monday. The entire country woke up that morning to news of yet another ‘worst’ mass shooting in American history, this time at a country music festival in Las Vegas. On that same morning, I heard a report on the radio about my long-time acquaintance, Sujitno Sajuti, an Indonesian immigrant, a devout Muslim living in West Hartford, who arrived in the United States legally on an education visa in the early 1980s. He lost his legal status through an unfortunate and complex set of events in the 1990s, and has been trying ever since to regain it. The radio report stated that Immigration and Customs Enforcement, ICE, had issued an order for his deportation. It was not a good day to start a sabbatical. As an aside, the Unitarian Universalist Church of Meriden offered sanctuary to Sujitno and his wife Dahlia. The couple has been living in the church since mid-October. The church has ongoing needs for financial, moral and physical support. If you are interested in helping out with the sanctuary process in Meriden, please feel free to speak with me about opportunities. I worked on a novel during my sabbatical. On most weekdays, I wrote between six and eight hours a day. I loved it, and I remain eternally grateful to you for providing me with this opportunity. After a few weeks of sitting and writing, I began to experience a feeling that I believe is always with me these days, but that I don’t typically notice. Perhaps I don’t notice it because I don’t have the time to fully experience it during the course of a normal week full of ministry, parenting, household chores, etc. Perhaps I purposefully ignore it. Clearly, the sabbatical process of separating myself out from the regular work of ministry, and perhaps the habit of sitting for long periods and focusing on one task, somehow brought this feeling more directly into my conscious awareness. The best word I have for it is sorrow. Physically I experience it in my upper back, between my shoulder blades. Maybe it spreads out from the back of my heart. It’s not physically painful, it’s a nagging, aching sensation. I don’t have many other words to describe it. It lives in that murky place, that visceral realm we inhabit before words form. Whenever I would pause to give it my full attention, to welcome it into my consciousness, to try to understand it, I would start to cry. The crying never lasted long. It wasn’t overwhelming. It was actually a great relief. As I sat with this sorrow, I started to recognize it as the crest of a wave, something I suspect many of us—if not all of us here—experience to some degree, a wave of profound soul-sickness in response to so many troubling trends. A profound soul-sickness over endless shootings and our collective, national inability to do anything that makes us safer as a society; a profound soul-sickness over the parent of gun violence: insatiable American militarism and unceasing war. Soul-sickness over irresponsible nuclear weapons brinksmanship and American drones relentlessly bombing innocent people. A profound soul-sickness over the ascendancy of fear and hatred of perceived others: a near-constant announcements of deportation orders, calls to rally in support of this Guatamalan name, that Nigerian name, this Indonesian name, that Mexican name, this Ecuadorian name—every name a story, every story a family, every family a community living with the threat of exile and loss. A profound soul-sickness over calls for religious freedom not even trying anymore to mask ongoing and un-Christian hatred of gay, lesbian, bisexual, transgender, queer and questioning people; a profound soul-sickness over continuous #metoo revelations of sexual assault and violence; a profound soul-sickness over the assault on decades of efforts to reduce racism in the criminal justice system; a profound soul-sickness over bills and laws and fiscal policies that unapologetically bankrupt our nation’s future and immorally redistribute yet more wealth to the wealthiest members of society. A profound soul-sickness over the denial and belittling of basic science, over climate-science denial, over the pursuit of energy policies that are hastening environmental catastrophe. A profound soul-sickness over the normalization of public-sphere lying. There’s more, of course.I’m not saying I wasn’t aware of these trends. I’m saying I wasn’t fully in touch with how all of it was making me feel, not until I had the chance to sit for weeks, and then months. For the past few years I thought I was just angry at so much violence and oppression. I didn’t realize how sorrowful I am. When our own inner world and the wide outer world feel like they’re breaking, when we are soul-sick, how do we cultivate and sustain our own sense of wholeness? I ask not simply so that we here may find comfort and solace in sorrowful times—as important as that is, it risks becoming a kind of escapism. I ask so that we may each be fortified in our own resolve and capacity to be ministers, healers, justice-makers and community-builders among ourselves and in the wider world. I’m reading Trauma and Grace: Theology in a Ruptured World, by Serene Jones, a Christian theologian and president of Union Theological Seminary. She offers two ‘habits of spirit’ that can move us toward a sense of wholeness in the wake of trauma: mourning and wonder. Habits—meaning part of our daily lives, part of our way of being in the world. She arrives at these habits of spirit not only through her scholarly work, but also through reflection on her own traumatic experiences, losses, struggles and sorrows, which led her to a crisis of faith. She emerged from this crisis through body work. It makes sense. Trauma, loss, grief, sorrow all live in the body: “quick-startle responses,” she writes, “headaches, exhaustion, muscle aches, distractibility, depression.” She reasoned that if trauma lives in the body then “grace capable of touching it should be equally physical.” She signed up for yoga classes and began working with an acupuncturist. These were her “liturgies of flesh.” From observing her bodily response to these practices, she gradually developed her habits of spirit: mourning and wonder. Mourning: “A disposition in which your heart and mind give into … loss and consent to dwell in the trauma with as much attention as can be mustered. It requires acknowledging how much was lost, how deeply it matters, how unstable the world has become in the aftermath, and how difficult it feels to be ever moving forward.” In other words, let us not shy away from sorrow. If we can mourn well, then wonder becomes possible. Jones says “Wondering is the simple capacity to behold the world around you (and within you), to be awed by its mystery, to be made curious by its difference, and to marvel at its compelling form.” As long as we have the space in our lives that mourning provides—even if it’s just a sliver of emotional space—then we have room to be curious, intrigued, inquisitive, thoughtful. We can wonder. The capacity to wonder, even in the midst of sorrow, pain, loss, trauma, is what enables us to notice and receive those things that are new and good in the world—the support of loved ones, the care of a loving spiritual community, the prayers of strangers, the myriad acts of kindness that happen every day all day long, “liturgies of flesh,” the beauty, grandeur, subtlety and diversity of the natural world, spring poking out around the edges of winter, and our own human depths—even in the midst of sorrow—our genuine, authentic, vital, alert, energized, creative, passionate, generous and good selves. Out of sorrow, soul. When our own inner world, and the wide outer world feel like they’re breaking, when we are soul-sick, how do we cultivate and sustain our own sense of wholeness? I offer you mourning and wonder, two habits of spirit, two paths to the soul, that can ground us, center us, and make us ready to be ministers, healers, justice-makers and community-builders among ourselves and in the wider world. Shaffer, Nancy, “Alchemy,” Instructions in Joy (Boston: Skinner House, 2002) p. 52. Shaffer, Nancy, “In Stillness,” Instructions in Joy (Boston: Skinner House, 2002) p. 5. Jones, Serene, Trauma and Grace: Theology in a Ruptured World (Louisville: Westminister John Knox Press, 2009) p. 158. Jones, Trauma and Grace, p. 163. Shaffer, Nancy, “Alchemy,” p. 52. “Come, My Way, My Truth, My Life”—a prayer from the early 17th-century devotional and mystical British poet, George Herbert. We also heard Mark Belletini’s meditation, “Mystical Song,” which riffs on Herbert’s prayer. Come, my way, my truth, my life. I have my own riff in mind this morning. What are the ways of this congregation? Do they serve us well? What new ways might we need to meet the challenges of the coming years? What is the truth that lies at the heart of this congregation? Is it, as Rev. Belletini says, “as exciting as fire, and as bright—as powerful as water, and as fluid—as solid as earth, but as transparent as air?” Will it sustain us in the coming years? What is the life this congregation saves, nurtures and sends forth into the world? Is it a life the world needs? Hold onto whatever answers may be popping into your head and heart as you hear me ask these questions. Your answers are important because they help inform our collective vision for the future of this congregation. I’m going to come back to them. But I want to start with a few words about my upcoming sabbatical. Today is my last day. Unless there is some extreme circumstance that demands my presence, the next time I lead worship from this pulpit will be February 4th, 2018. I’ve written a number of times about how various aspects of the congregation’s ministry will be conducted during the sabbatical, but it feels important for those of you who haven’t been part of the planning to hear directly from me about the plans. First, believe this: UUS:E has a very strong, talented, dedicated leadership team and staff. So much that happens here happens with either very little or no direct input, guidance or oversight from me: children’s religious education, most adult religious education, sustainable living and green sanctuary programming, multigenerational events, two fifths of all Sunday morning services, concerts, art shows, Sunday morning hospitality, and most fundraising events including our annual appeal, the holiday fair, and the goods and services auction. We have outstanding leaders. Not just during my sabbatical but always: you are in great hands. We’ve lined up eight guest preachers over the next four months, including next week Dr. Reza Mansoor, a leader of the Connecticut Muslim Coalition. Later in October, Rev. Jan Carlsson-Bull of the UU Church in Meriden will lead us in responding to the UU call for a second White Supremacy Teach-in. In November you’ll hear from Bailey Saddlemire, a youth who grew up in this congregation until her family moved to Providence a few years ago. She now serves on the Unitarian Universalist Association Board of Trustees and has many powerful stories to tell. Later in November, Revs. Carolyn Patierno of All Souls UU in New London and Heather Rion Starr of the Unitarian Society of Hartford will preach. In early December Rev. Kathleen Green, Executive Director of the Yale Humanist Community, will be here. In January Rev. 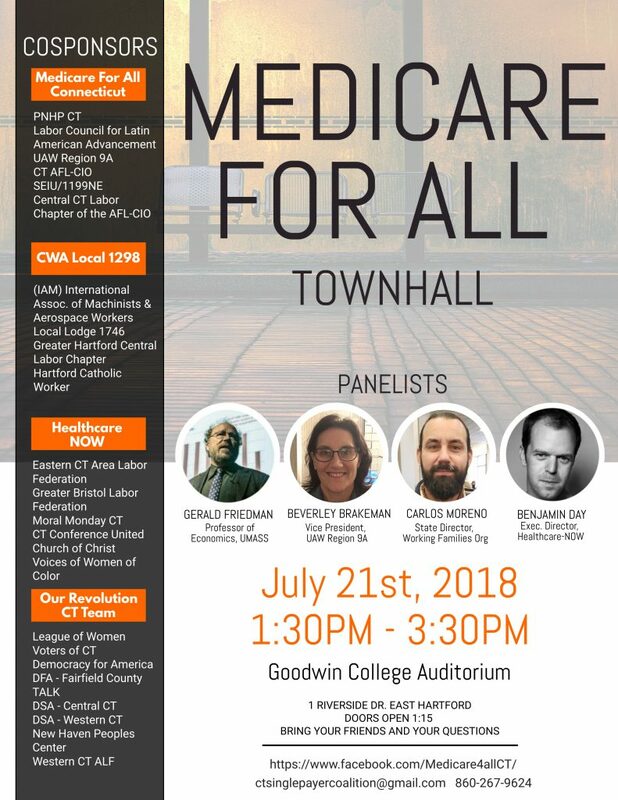 Jean Wahlstrom, a UU minister and member of this congregation, and Bishop John Selders of Amistad United Church of Christ in Hartford and co-founder of Moral Monday CT will preach. As always, the Sunday Services Committee will be bringing a variety of lay-led services. Some will be multigenerational, designed in collaboration with Gina Campellone, our Director of Religious Education. It’s gonna be great! Perhaps an even larger sabbatical question is “what happens with pastoral care?” There are three parts to this answer. Part One: I mentioned extreme circumstances. I consider death and dying an extreme circumstance, and I expect to provide the ministry I would normally provide in the event someone is actively dying or has died. Having served as your minister for fourteen years, I can’t imagine not being present under these circumstances. I’ve talked to many of you about your memorial services already. In some instances I already know members of your extended family. I know many of you theologically, many of you musically. I know your passions. I love you. There no universe in which it would be OK for me to say, if someone is dying or has died, “I’m on sabbatical, find someone else.” I want to be there. That’s my rule. Some clergy disagree, but that’s how I roll. Part Two: We have a 10-member Pastoral Friends Committee, ably led by Patricia Wildes. While I am on sabbatical, any request for help of a pastoral nature from the congregation should go to Patricia. She and the Pastoral Friends Committee can organize much of the help people typically need—rides, meals, visits. Patricia will also manage the Minister’s Discretionary Fund for people who need financial assistance. Part Three: For people experiencing some sort of spiritual crisis who want pastoral support from a professional minister on a short-term basis, we have a list of area clergy—all Unitarian Universalist and one from the United Church of Christ—who are willing to receive calls. Patricia Wildes can help you connect with one of those clergy if needed. There are many other responsibilities and roles I have at UUS:E that will be on hold. Staff supervision will be on hold, though the staff know if they have any problems they can speak with our Personnel Committee or the Board President, Rob Stolzman. My work with our Emergency Preparedness Team, Mental Health Ministry, Council of Elders, Circle Groups, Social Justice / Anti-Oppression Committee, Membership Committee, Policy Board, and Program Council will be on hold, though all of these programs and committees will continue. You are always in good hands. There’s a very obvious opportunity for me in taking a sabbatical. It’s an opportunity to pull back from the daily tasks of ministry, to pull back from being on-call at essentially all times—even during vacations—and to work on a project that I otherwise wouldn’t have time to work on. And, as the word sabbatical implies, it’s an opportunity to rest. I cannot express to the Policy Board and to you the depth of my gratitude for this opportunity. I am aware the vast majority of people don’t get sabbaticals. This is a privilege beyond measure. It is a blessing. You are blessing me with a gift of precious, sacred time. From the bottom of my heart, thank you, thank you, thank. Within this opportunity is a chance for me to discern which aspects of my ministry remain critical to fulfilling both my vision for myself as a minister and the congregation’s vision for its ministries; and which aspects of my ministry are actually not so critical, not so essential, and might even be getting in the way of fulfilling my vision and yours. Might it be time to let go of some of the ways I conduct my ministry, some of the programs I invest my time in? When I’m in the midst of it all, it can be difficult to do this discernment. Everything feels important all the time. Taking a sabbatical will allow me to recognize why I do what I do the way I do it; what I miss and don’t miss about the ministry; and what feels critical and essential vs. what doesn’t. There’s a similar opportunity for you. During a sabbatical the congregation has the opportunity to notice, by virtue of the minister’s absence, what it does well, what it does not do so well, where it excels, where it needs improvement. It has the opportunity to discern what ministries it needs a professional minister to conduct; and what ministries lay people can conduct. The minister’s absence causes a natural ferment of thought and reflection. The absence creates space for new insights to emerge. Of course, you don’t want to make any major decisions in the minister’s absence—like voting to expand the building. Please wait until February to do anything that drastic! But my absence, and the presence of a variety of guest voices, creates a very natural opening to new ways, new truths, new life. Come, my way, my truth, my life. This sabbatical comes at a very opportune time. This congregation is at a point where it needs to establish a new vision. It’s been seven years since we moved into this renovated, green, accessible building. During that time, the world has changed. It’s time for us to re-envision our future. Who do we want to be? What directions do we want to move in? It’s time. Therefore I challenge you—each of you individually and all of you collectively—under the leadership of the Policy Board and Program Council—to reflect on our congregational vision in the coming months. What is the vision for our ministries five or ten years from now? What do we want to achieve? What are the components of our best future congregational self? Come, my way, my truth, my life! It’s actually your job to answer this question. In Unitarian Universalism we practice congregational polity. This means the congregation governs itself. The congregation belongs to its people. The people envision their own future together. This doesn’t mean that the minister can’t have a vision—you certainly want a minister who is visionary—but ideally the congregation’s vision and the minister’s vision are in alignment. So please let this sabbatical time be a time of discernment for you. It has already begun. Our leadership team held a retreat this weekend with the purpose of beginning to craft a new vision. Later this fall they’ll share their initial thoughts with you and request your feedback, which will help us collectively craft a vision statement that the congregation can approve at its annual meeting in May. I want to tell you just a bit about this weekend. Before we engaged in our own process of visioning, we acknowledged that there are many voices and identities that aren’t present in our membership, especially not in large numbers. Mindful of this, and mindful of the movement within Unitarian Universalism today to understand and confront white supremacy, we invited a group of People of Color leaders from Manchester and Hartford to speak to us Friday night about their vision for this region and their ideas about how a congregation like ours might be able to contribute to that vision. We listened. We heard things—hard, heartfelt, honest things—we wouldn’t have heard otherwise. We were deeply grateful. Then, with their words reverberating in our hearts, we engaged in our visioning work. Come, my way, my truth, my life. Looking towards the future, what will be our way? Building community—caring, heart-centered, thoughtful, spiritual community. Community that supports those who are vulnerable. Community that speaks for those for whom it is too dangerous to speak. Community that encourages and promotes courageous conversations about difficult, polarizing topics. Community that lets people be who they are, that encourages people be true to themselves rather than feeling they must hide part of who they are just to get by. Multigenerational community. Multicultural community. Multiracial community. Community that expands outward from a tight, robust, fun, liberally religious, deeply spiritual congregation here at 153 West Vernon St. to partners in the wider community: to liberation and social justice organizations, to interfaith and religious organizations—especially religious to minorities who face persecution in American society—to arts organizations, to service organizations—a vast network of connection, interplay, mutual support and caring. Come, my way! Looking toward the future, what is our truth? The answer is so clear to our leaders: love. Perhaps first and foremost: learning again and again and again to love ourselves. In the midst of white supremacy, in the midst of climate catastrophe, in the midst of political polarization, in the midst of violence and hatred, in the midst of profound inequality and endless need, learn to love ourselves deeply so that we may we have great stores of love with which to bless the world; love for neighbors, love for strangers, love for children, love for elders, love for the lonely and the isolated, love for the demonized and the scapegoated; love across lines of faith, culture, ethnicity and race; love across lines of gender and sexual orientation; love across lines of city and suburb; love so vast and deep that these lines that vex us start to blur, start to disappear; so that our connectedness and our oneness shine forth not only in what we say but in what we do. Come, my truth! Looking toward the future, what is our life? The answer that came through from our panel on Friday and our discussions on Saturday is authenticity, the life of people who don’t hide, who let their light shine, who speak their truths, who feel, who sing and dance; people who know themselves deeply, share themselves generously, who listen well to other selves, respect and honor other selves, celebrate other selves. What is our life? It is a bold life, not afraid to dream, not afraid to risk, not willing any longer to play it safe when the world’s need is overflowing. What is our life? It is a committed life, a connected life, a powerful life. It is our energy, spirit and strength sent forth into the world to love, to be present to suffering, to comfort, to heal; to bear witness to oppression and injustice; to resist and dismantle the systems that hold oppression in place, to build a more just, loving and fair society. Come, my life! That’s my best initial articulation of our emerging vision for this congregation’s future. What I hope is that in the space of this sabbatical time, you individually and as a congregation can continue this conversation and imagine the most compelling UUS:E future possible. Imagine what has never been imagined before. I challenge you to think big. Think boldly. Don’t worry about the technicalities of how some new ministry might come to fruition. Don’t worry about whether or not we have the resources. Take time to imagine amazing what-could-bes. Take time to imagine a spiritually alive, powerful, transformative, life-saving, life-giving, connected congregation. If the vision is compelling, the resources will come. You all have it within you. Be visionary! “Come, My Way, My Truth, My Life.” May the ways of this congregation meet the needs of a hurting world. May the truth that lies at the heart of this congregation be “as exciting as fire, and as bright—as powerful as water, and as fluid—as solid as earth, but as transparent as air!” May the life this congregation saves, nurtures and sends forth bring love and healing into the world. You each have it within you. In the coming months, be visionary. Belletini, Mark, “Mystical Song,”Sonata for Voice and Silence (Boston: Skinner House, 2008) p. 23.